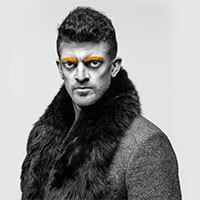 The Overcoat - A Musical Tailoring is an operatic adaptation of Morris Panych and Wendy Gorling’s non-verbal pièce de theatre, which itself was inspired by Nikolai Gogol's 1842 novella also titled The Overcoat. Just like the original, and perhaps even more so with the Panych and Gorling recreation, this black comedy is a compelling study of human behaviour. Baritone Geoffrey Sirett turns in a befittingly quirky performance as the ill-fated Akakiy, whose curious disposition of hypernumeracy gifts him a professional advantage, yet eventually becomes his undoing. His colleagues mistrust his fixation with numbers in the collective amusing aria “No one likes a diligent man” (do the minimum that you can). This Vancouver Opera Festival production of The Overcoat - A Musical Tailoring is exquisitely staged and beautifully performed. The orchestra under the leadership of Maestro Leslie Dala interpreted James Rolfe’s unfamiliar score as if it were au fait. “Head of the department” and “Host of the party” both seemed like they may have been borrowed from Gilbert and Sullivan. Outside of the protagonist role, the production is essentially an ensemble piece with all the cast taking equal responsibility for the opera’s success. However, a special kudo goes to soprano Meher Pavri, who makes her exposure to Bharat Natyam dance count in a delightfully coquettish reading of the secretary. Mezzo soprano Andrea Ludwig acquitted herself well as Akakiy’s wanton landlady. She gets to sing one of the few solo arias in the show that discepts the flummeries of outward appearance. Ken MacDonald’s set together with Alan Brodie’s lighting combine to create what is at times a surreal framework and ambience. Nancy Bryant’s clothing brings another element of quality to the production. At a few minutes under two hours (including a twenty minute intermission), it’s short when compared to full scale classical operas, audiences leave the auditorium with time to visit the Festival Opera Bar.